Bombing Suspect Pleads Not Guilty To Attempted Murder And Weapons Charges : The Two-Way Ahmad Khan Rahimi, accused of bombings in New York and New Jersey, entered his pleas in a New Jersey state court. He has not made any court appearances in connection with separate federal charges. 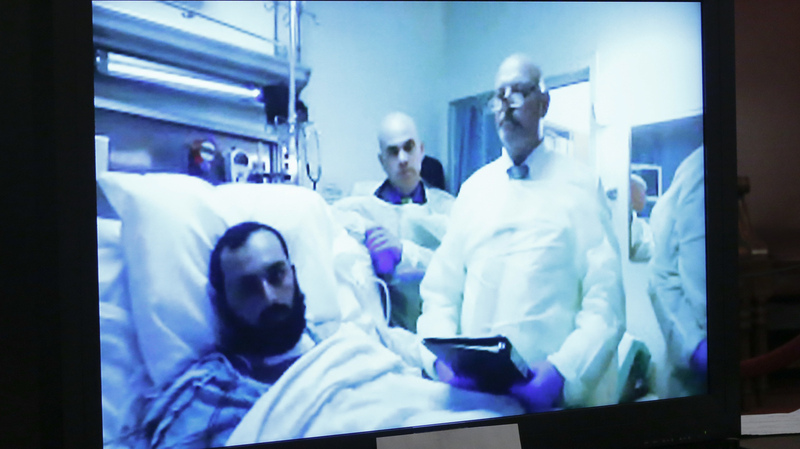 Ahmad Khan Rahimi spoke to an Elizabeth, N.J., court by video from his hospital bed Thursday. He entered pleas of not guilty to charges connected with Sept. 17 bombings in New Jersey and New York. The suspect in last month's bombings in New Jersey and New York that injured dozens pleaded not guilty Thursday. Ahmad Khan Rahimi was arraigned in Elizabeth, N.J., via teleconference. The 28-year-old Rahimi has been recovering in a hospital after a shootout with police. He pleaded not guilty to state charges of attempted murder and weapons offenses. Suspected bomber Ahmad Khan Rahimi attended his first court hearing by video connection. He pleaded not guilty to New Jersey state charges, and will face separate federal charges. 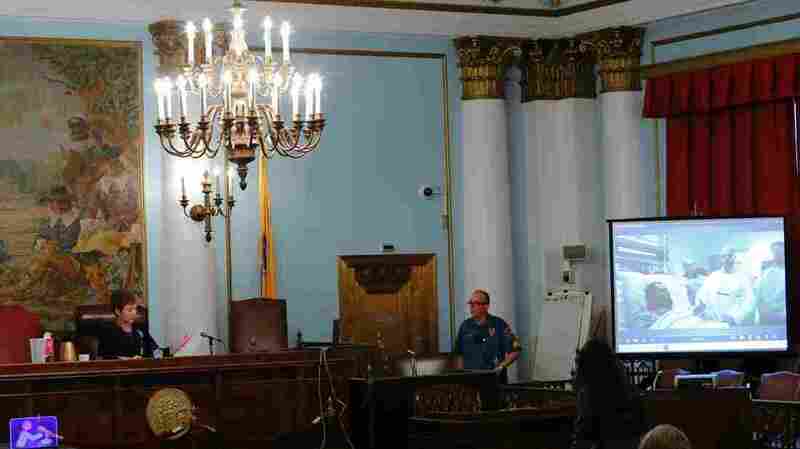 The charges are related to Rahimi's alleged detonation on Sept. 17 of a pipe bomb along the route of a charity race in Seaside Park, N.J., and a pressure-cooker bomb in New York. No one was hurt in the New Jersey bombing. "Rahimi, an Afghan-born U.S. citizen, has been hospitalized with gunshot wounds since a police shootout that led to his capture on Sept. 19 outside a bar in Linden [N.J.]. His head was propped up on pillows, while public defender Peter Liguori stood by his side wearing a disposable hospital gown and plastic gloves. "Rahimi, 28, is charged with five counts of attempted murder of a police officer and weapons offenses. He was read his rights by Judge Regina Caulfield and answered "yes" in a faint voice to a series of questions she asked him." The hearing had been delayed while Rahimi remained unconscious for weeks, recovering from his injuries. At Thursday's hearing, Liguori corrected the spelling of the suspect's name, which the government had said was Rahami. The state court proceeding was Rahimi's first public appearance. He also faces separate federal charges.